Today I’m featuring Lexie from Mommy: Home Manager. She’s a full-time working mom and a blogger. Read about the few changes she made after she went back to work post baby. The struggle is real, and Lexie managed to find a balance that works better for her. Describe your home life – how old are your kids? Does your spouse work as well? Or are you a single parent? My home life is (fortunately) pretty relaxed right now. We have a 9-month-old little boy – I call him Peanut in my blog – who is getting more fun and energetic everyday! My husband and I both work full-time, so when we are home we like to simply spend time as a family. We get as many chores done as we can with still allowing for time to just hang out. What do you do? Describe your working life. I am the Operations and Logistics Assistant for a production company in the live entertainment industry. Up until a couple of months ago, I was a full-time dance stage manager – primarily ballet. I wanted something where I could use my management and organization skills, but still be home at a reasonable time. Now I sit at a desk 8:30-5:00 and coordinate travel, schedules, freight invoices, and anything else that needs coordinating. I miss being out at performances, but my work/life balance is much better now. I love being home in time to have dinner with my family every night. And how many hours do you work in a week? 40 – I am paid hourly, so my time is flexible when I need it to be, but the structured 40 hour work week is great for me. I returned to work 10 weeks after my son was born. I was working for a ballet company, and returned just in time to stage manage a run of The Nutcracker. It was the hardest thing that I have ever done! My first couple of weeks back were 50 hour weeks, and then there were performance weeks with wonky schedules. I very quickly realized that even though I was more than capable of continuing to work the ridiculous schedule needed for the job, I did not want to. I was lucky enough to find a job that is much more suited to my desired lifestyle. What do you do to treat yourself? Do you have something in your routine that you do just for you? Every morning I have a cup of coffee and exercise when I first wake-up. It is a really great way to start my day! On weekends when I want to sleep in a little, I go to the gym so that I can have me time while Peanut is at the childcare center. Touch on your most and least favourite things about being a working parent. My son motivates me to continue working. I want him to see that his mom works hard to be able to provide him the best of everything. Also, as selfish as it may sound, going to work is me time. I can have accomplishments that are just mine while someone else cares for Peanut – it helps that I know our babysitter loves him! Obviously, while I am at work I miss my son. I also know that if I had more time at home, I would be able to take better care of the house itself. I have had to learn to relax and let things get just a little messy. My idea of how I want our future to shape up changes all the time! Right now I am trying to grow my blog and at home wine business because I would love to be able to spend more time working from home. The one goal that stays consistent is raising a happy, healthy, hard-working, Christian young man. As long as we are able to enjoy our time as a family, everything else we will figure out as we go. Any tips to share for balance in your life? I follow a weekly cleaning list (you can check it out here: http://www.mommyhomemanager.com/weekly-cleaning-list/) that breaks chores down into short lists for every day of the week. I find that spending a small amount of time keeping things clean helps to avoid long cleaning binges. It’s much easier for me to relax in a clean home than in a messy one. Lexie is a full-time working mom and organization nerd. She loves spending time with her family, coffee, yoga, pilates, and making lists! You can see her tips to manage your home, baby, budget, and health & fitness at Mommy: Home Manager. If you enjoy this series, click here to read the other ladies who’ve volunteered their stories. And then subscribe to my blog so you’ll get my posts delivered to your inbox. 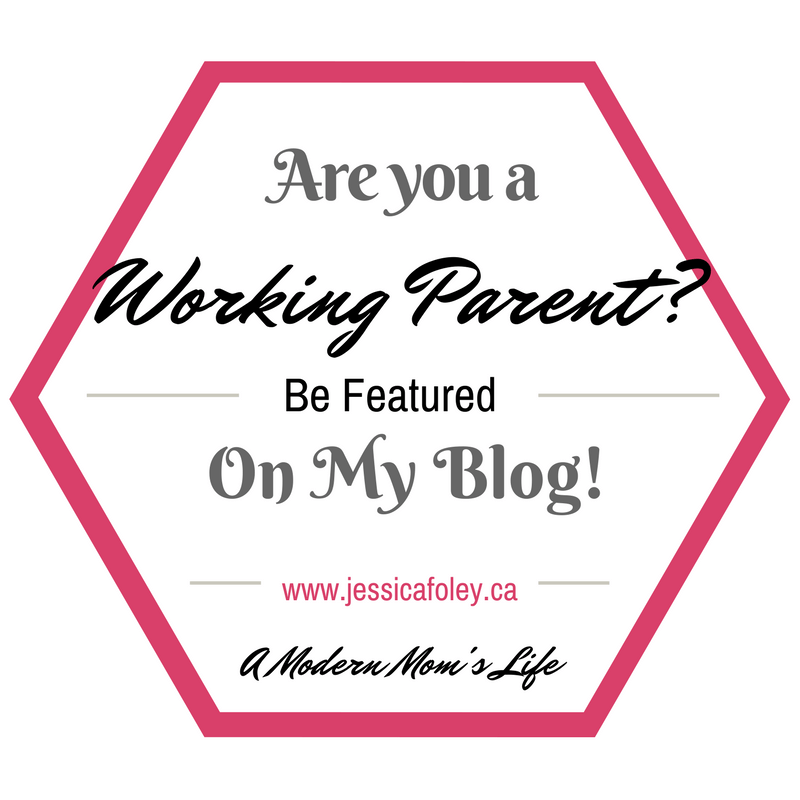 If you’d like to be featured, email me at modernmom@jessicafoley.ca or visit my contact page for other ways to get in touch. Thank you for sharing. I like the fact that Lexie has found the right balance for her and family. It is so important that parents are the main influence in their children’s lives- spending 40+ hours a week out of the home can prove challenging. I am also glad to see Lexie has got her life sorted so well! This was a great, positive story to share and I was happy to publish it!